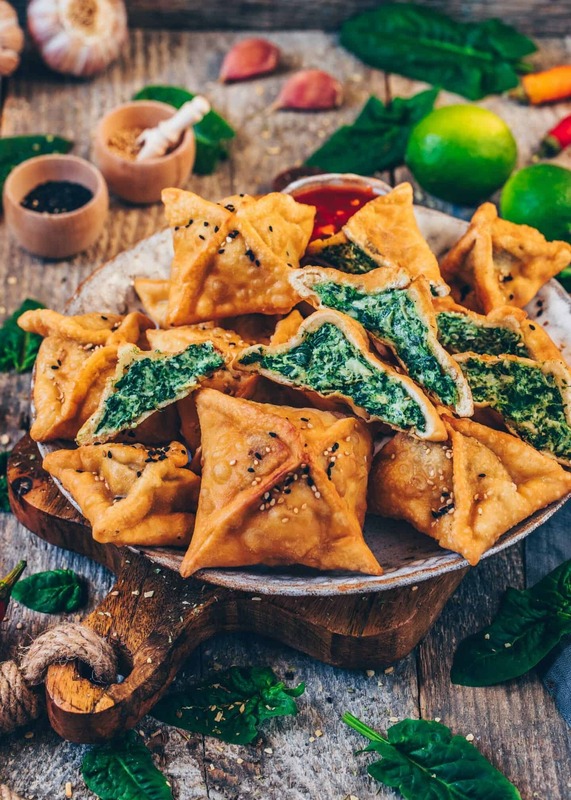 These crispy Spinach Artichoke Wontons make for the perfect snack, appetizer, or lunch! 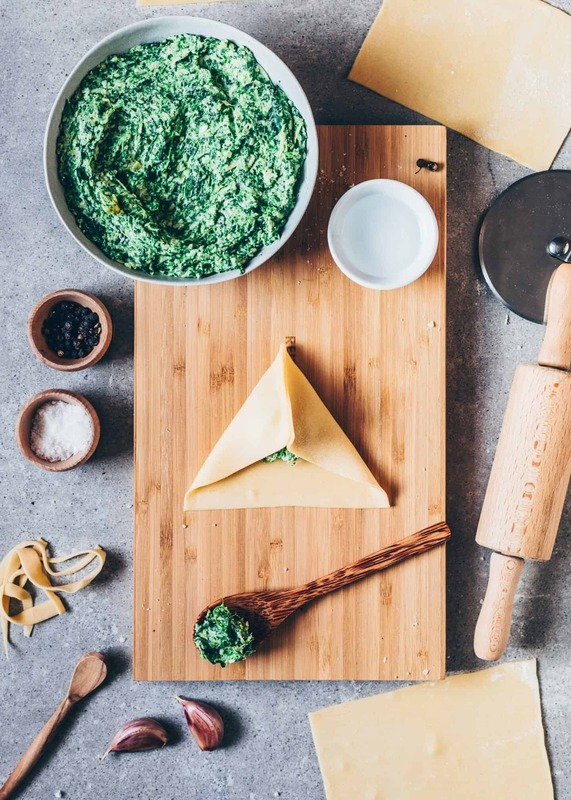 They’re made with Homemade Wonton Wrappers and filled with a creamy & cheesy Spinach Artichoke Dip! This easy Recipe includes step-by-step pictures showing you how to wrap them. 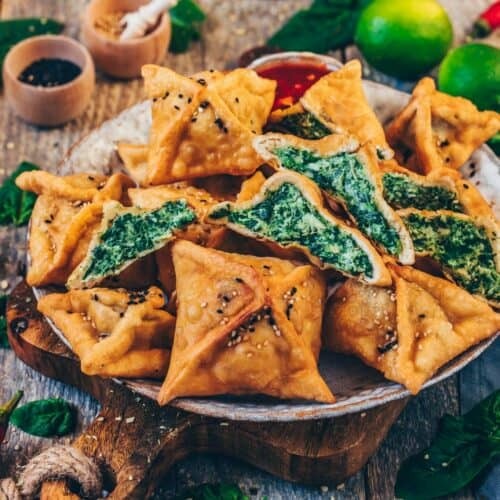 Can you remember that I mentioned in my Dumpling Recipe that I want to try Wontons next? Well, I did it, and here is the recipe for you guys! 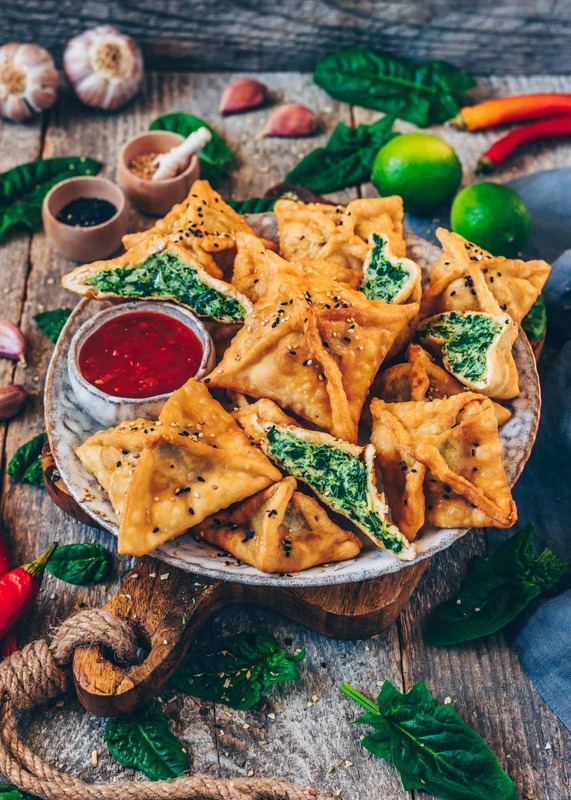 They’re crispy on the outside and creamy on the inside, made with Wonton Wrappers from scratch. How does that sound to you? 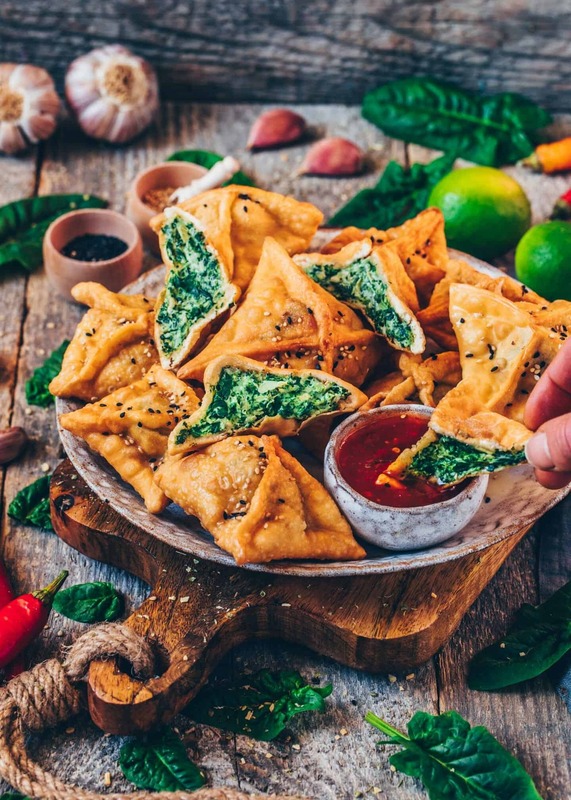 If you’re excited now, you should definitely give these Spinach Artichoke Wontons a try! After trying them for the first time, this recipe has already become another one of my favorite Asian-inspired meals. One that can be made easily at home. I filled them with a creamy and cheesy Spinach Artichoke Dip which is fairly easy to make. First, sauté the onions and garlic for the flavors and cook the spinach until wilted. 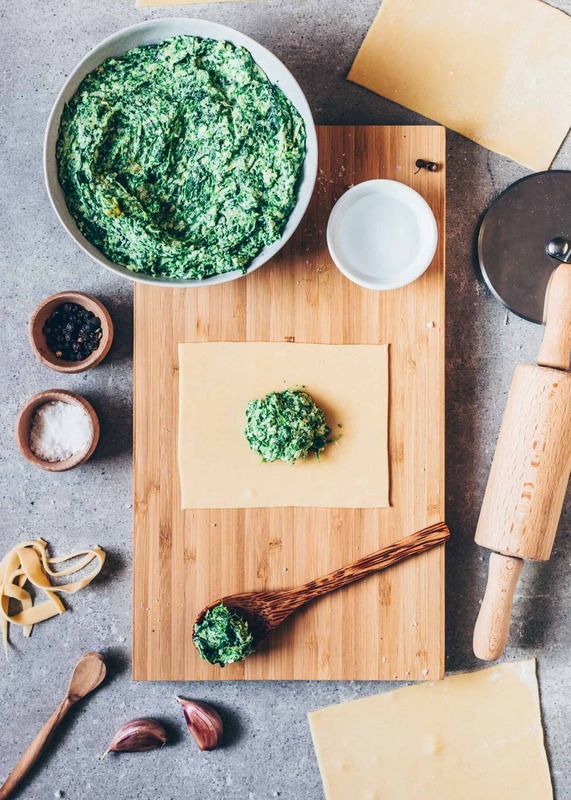 Secondly, mix everything together until you have a delicious and creamy Spinach Artichoke Dip, and Voilà! 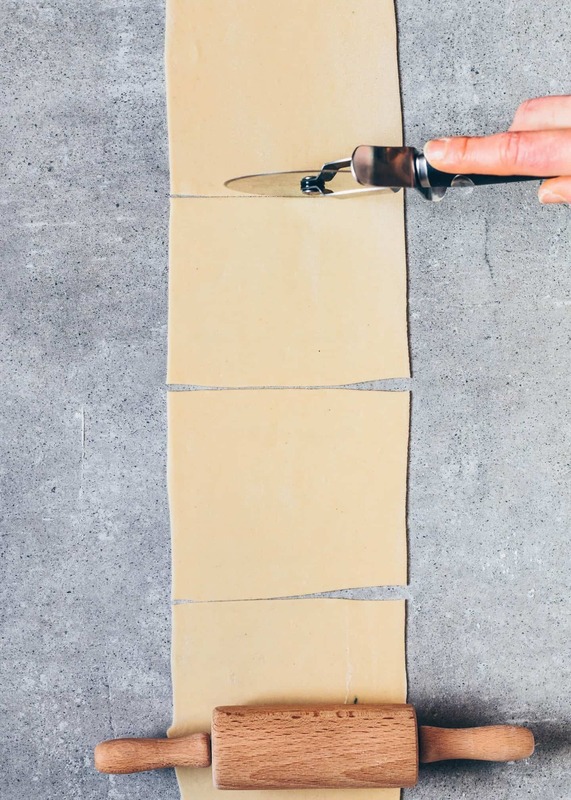 Making Wonton Wrappers from scratch is super easy! All you need is flour, a little salt, and hot water. Simply knead everything together to form a smooth dough. Then wrap in cling foil and place in the fridge for half an hour. After chilling, you can roll out the dough thinly and cut out squares using a pizza cutter. Make sure to dust them with a little flour or cornstarch, otherwise, they’ll stick together. Also, I recommend covering the squares with a piece of cling foil or a damp towel, because the thin dough gets dry rather quickly. Of course, if you’re in a hurry, you can use store-bought Wonton Wrappers. 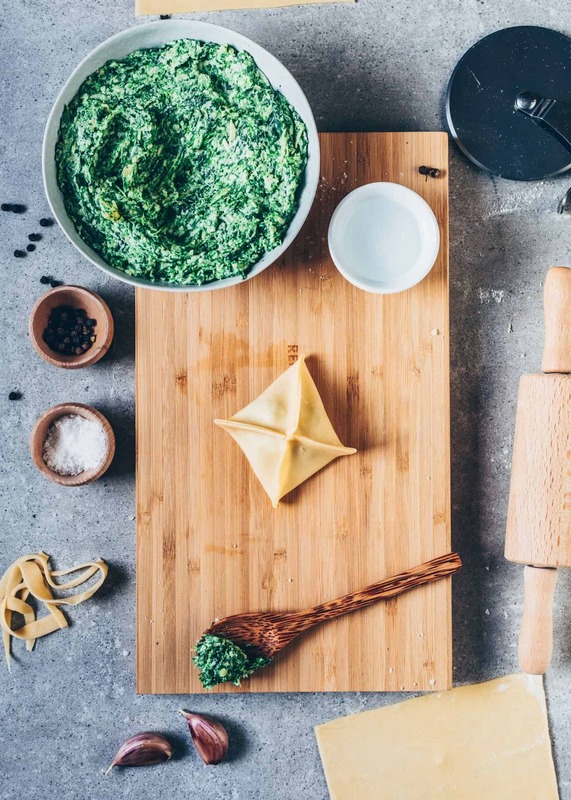 To wrap them, place a wonton wrapper on a floured surface and scoop a tablespoon of the spinach artichoke filling into the center. Brush the outside edges with a little water using a brusher or just your fingers. This helps the edges stick together when sealing. Then gather the four corners of the wrapper and bring them to the center, pressing them together. Please always make sure to seal the wonton edges completely. Repeat with remaining ingredients until all of the mixture is used. Usually, I prefer baking everything, but this time I decided to fry them crispy. 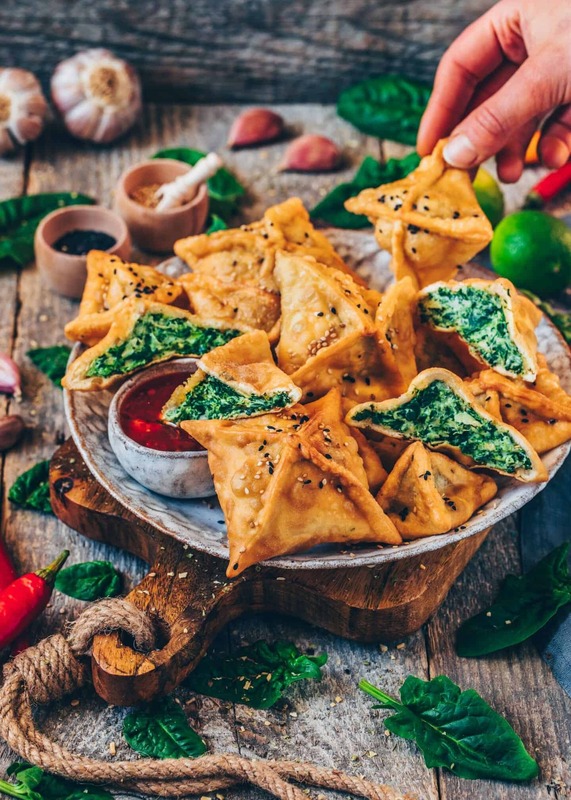 Nevertheless, these Spinach Artichoke Wontons can also be baked in the oven for a healthier (yet still crispy) option, like I did with my Spinach Pockets. Alternatively, you can serve them pan-fried and steamed as well, like Gyoza Dumplings. However, I personally find that it’s definitely worth frying them. I don’t think you have to be afraid of that, seeing as how they won’t soak up tons of oil. You only need enough oil inside your pot so that they don’t touch the bottom. Also, make sure that the oil has the ideal temperature of 175 degrees Celsius (350°F). The perfect appetizer, party snack or side dish! 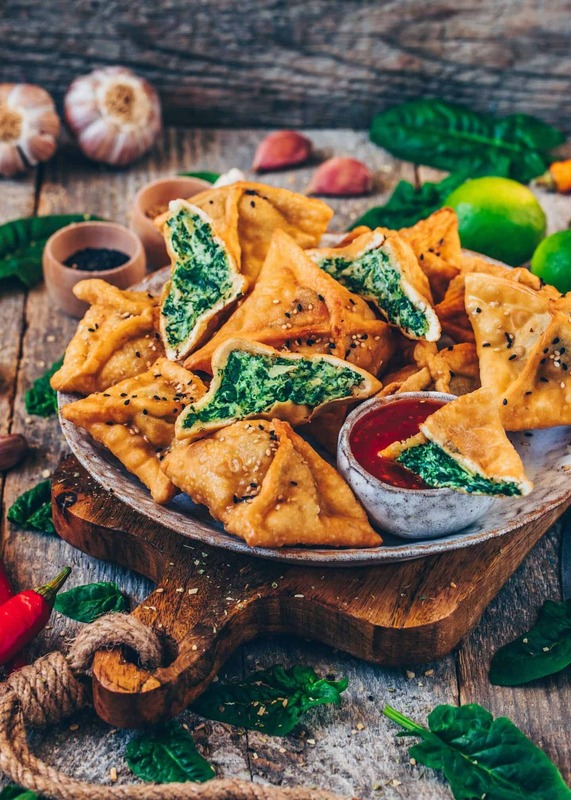 These crispy Spinach Artichoke Wontons taste delicious on their own. But even so, I find they taste even better when you serve them with Dips! You can, for example, make a homemade BBQ sauce or Ajvar Dip, or use a store-bought sauce or dip for a quicker option. Whatever you decide, I assure you, once you start dipping, you won’t be able to stop eating them! Mix the flour and salt in a bowl. Add the water while stirring to combine. Transfer to a working surface and knead for about 3-5 minutes until you have a smooth and soft dough. Form into a ball, wrap in cling film and refrigerate for 30 minutes. 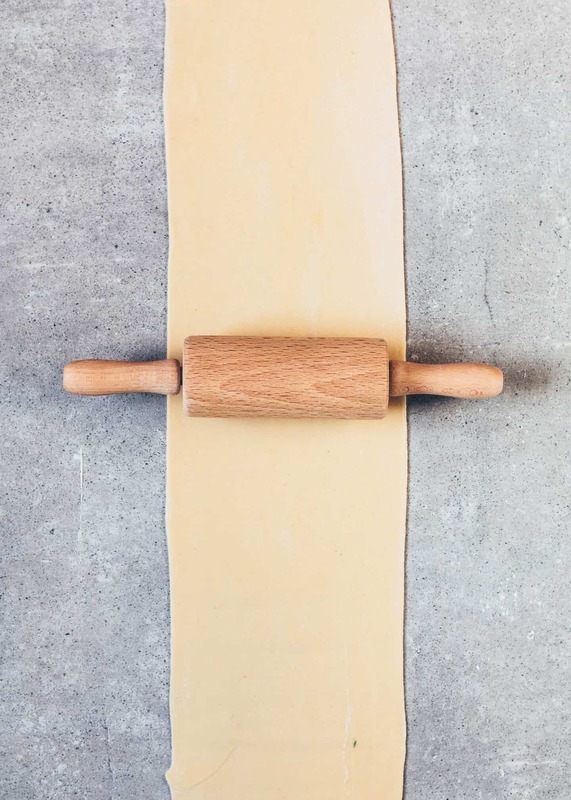 Divide the dough into two pieces (This makes it easier to roll out). Dust the working surface with a little cornstarch and roll out the dough into about 2mm (1/14-inch) thick. Cut out squares using a pizza cutter (mine were 4,7-inch (12cm) in diameter). Remove the trim, knead it into a ball, and roll it out again to cut out more squares. Dust the wrappers with some cornstarch before stacking them up, otherwise they will stick together. Use them right away or store in an airtight container in the fridge or freeze. Heat a little water in a pan. Add the onion and sauté for 2-3 minutes until translucent. Add the spinach and cook for 1-2 minutes longer until wilted, stirring occasionally. Add the minced garlic and cook for an additional 30 seconds until fragrant. (If using frozen spinach, just thaw, squeeze and combine with roasted onions & garlic). 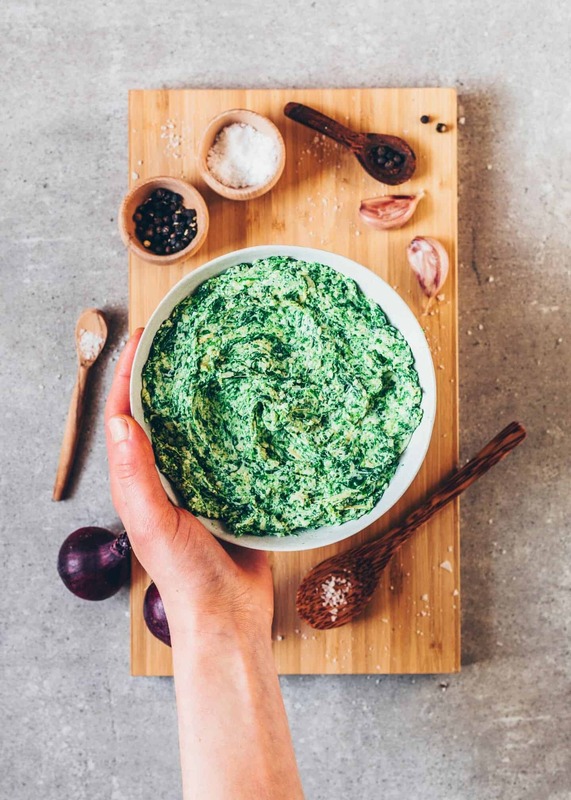 Transfer the spinach, onion, and garlic to a mixing bowl and squeeze to remove excess liquid. 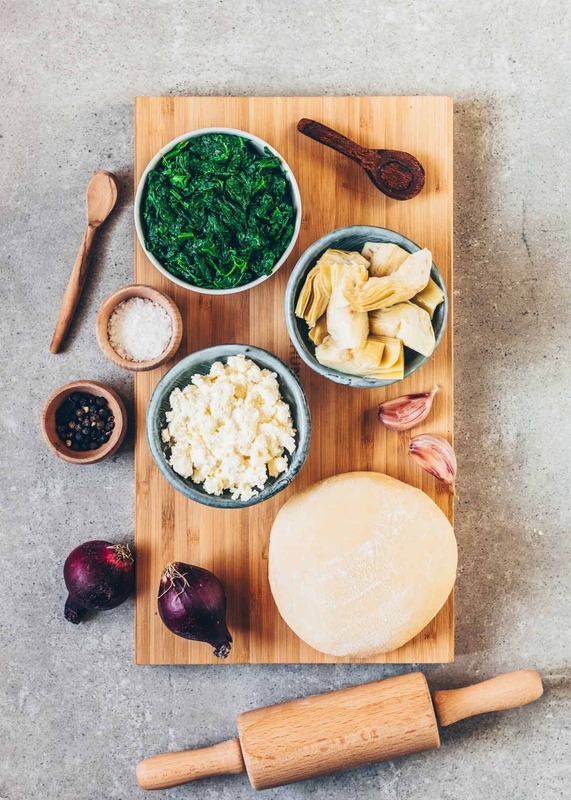 Add the artichoke hearts, non-dairy cream cheese (or cashew-ricotta), non-dairy sour cream (or vegan mayo), non-dairy parmesan, salt and pepper to taste and stir to combine. Place a wonton wrapper on a floured surface. 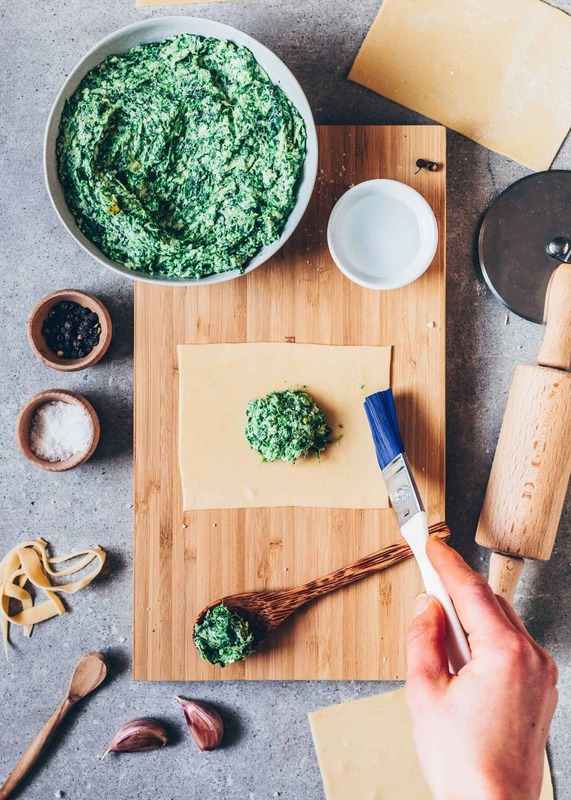 Scoop a tablespoon of the spinach artichoke mixture into the center. Brush the outside edges with a little water. Gather the four corners of the wrapper and bring them to the center, pressing them together using your fingers. Make sure to seal the wonton bites completely. Repeat with remaining ingredients until all of the mixture is used (or make a few batches at a time and fry/bake in between). 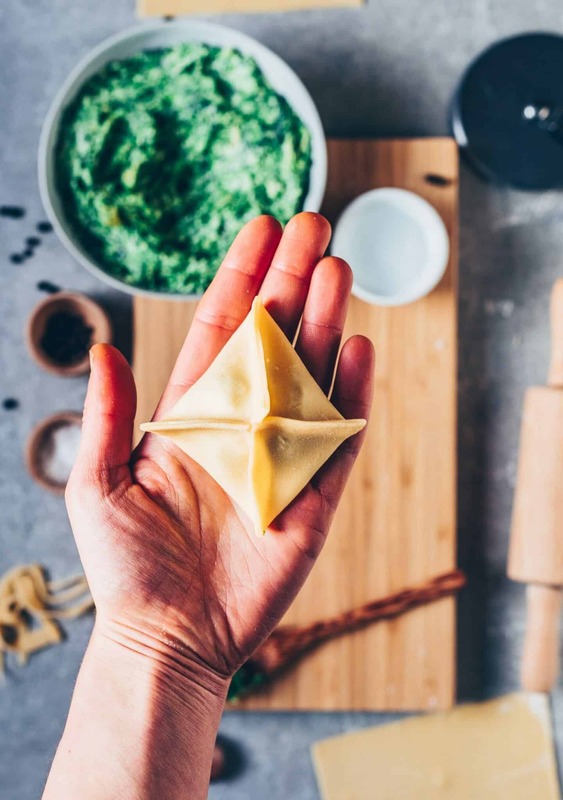 Optionally, store the rest of the filling in the fridge to use the next day, or freeze uncooked wontons for another day. Place the wontons on a baking sheet lined with parchment paper and lightly spray the wontons with a little oil from all sides. Sprinkle over some sesame, if you like. Bake in a pre-heated oven at t 400°F (200°C) for about 10 minutes until golden and crispy. Heat some oil in a shallow frying pot on medium heat. The ideal temperature is 350°F (175°C). Slowly place the wontons in the hot oil and fry until the wontons are golden brown on each side. 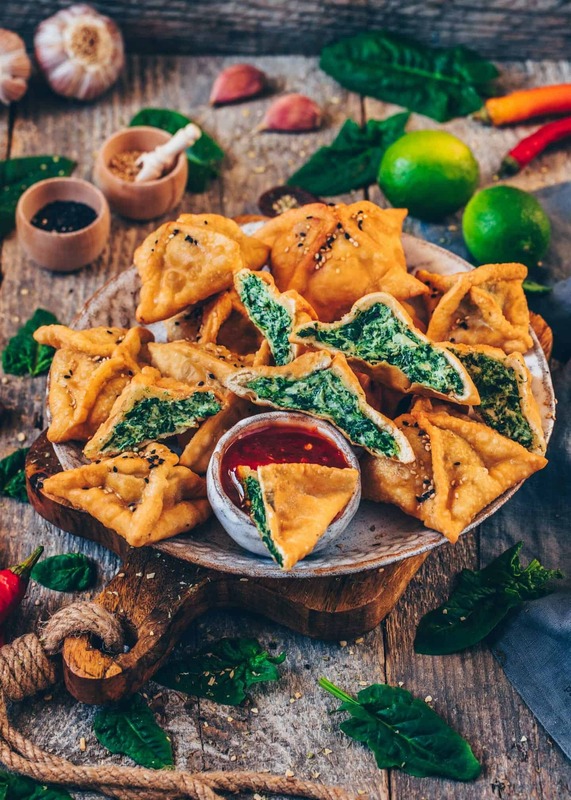 (The amount of wontons you can fry at once depends on the size of the pot you have. Please do not overcrowd the pot). Once they are done, place them on a few paper towels to absorb any excess oil. 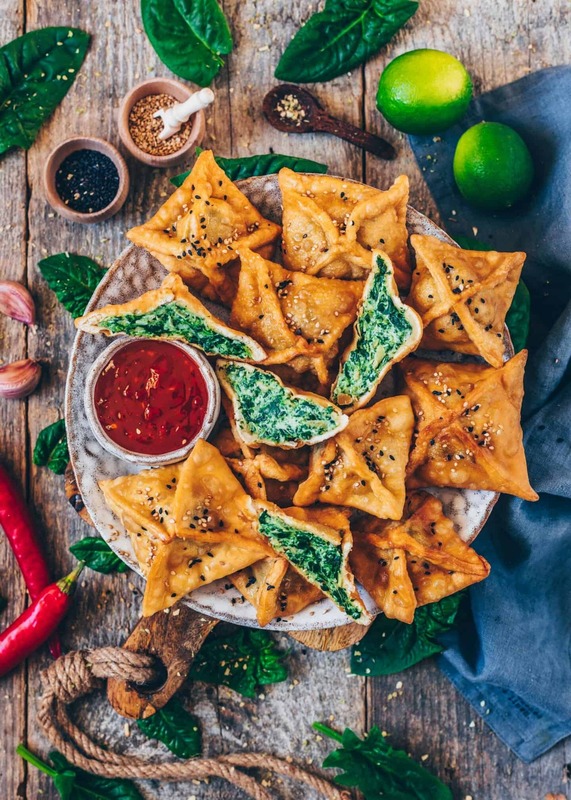 Wontons are best eaten hot with your favorite dipping sauce. I like a sweet & sour chili sauce best. The total amount of Wontons may vary, depending on the thickness of your Wrappers. 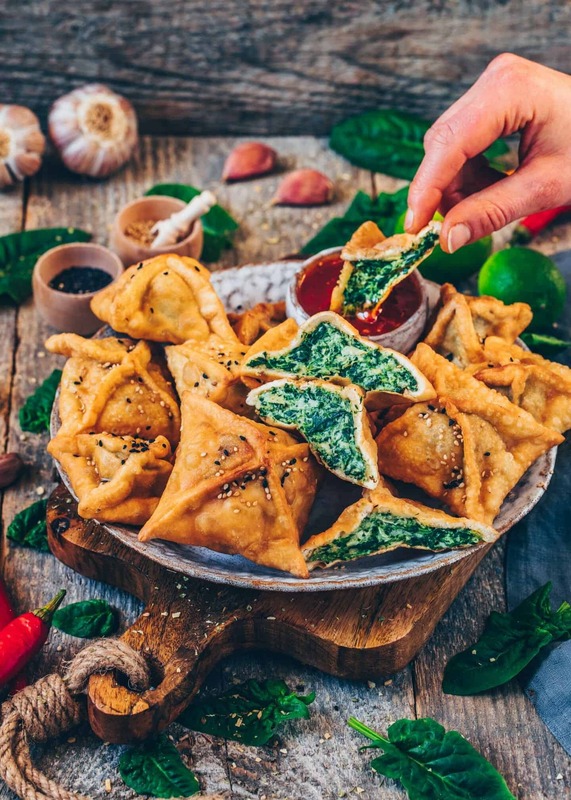 Make ahead: You can prepare the filling one day in advance and simply assemble the wontons and fry/bake when you're ready to serve. 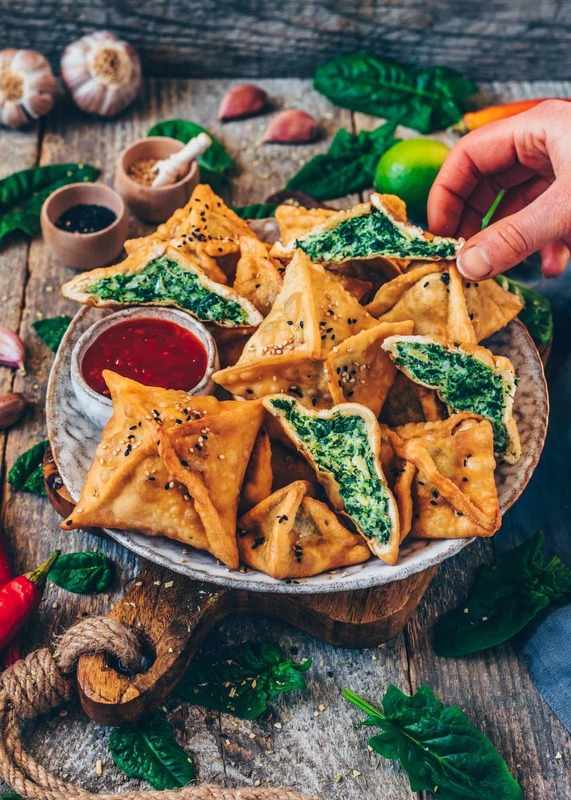 To freeze the Wonton Wrappers, wrap up an entire stack with cling film, making sure to dust them with cornstarch, and place in the freezer. To use, place the frozen wrappers in the refrigerator until thawed. 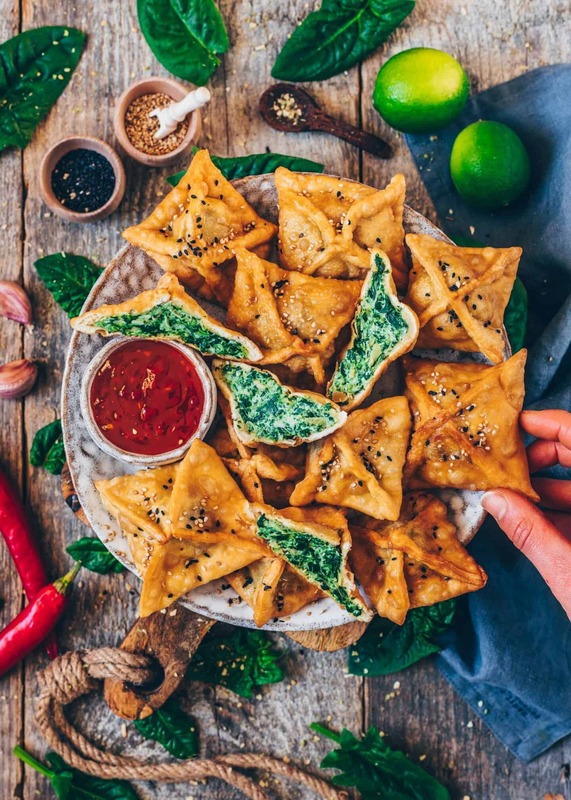 To freeze the uncooked Wontons, place them in a single layer on a baking tray or board, leaving some space between each to prevent them from sticking. Freeze for 1-2 hours, then transfer to a freezer bag. To serve, simply fry right out of the freezer. You don’t need to thaw them.